Art is typically only visual, such as paintings, graphics, sculptures & performances. Exhibits, museums & private residences are filled with these one dimensional sensory items. They engage, entertain, produce emotions & thoughts. Imagine if more senses were involved in understanding or appreciating art? 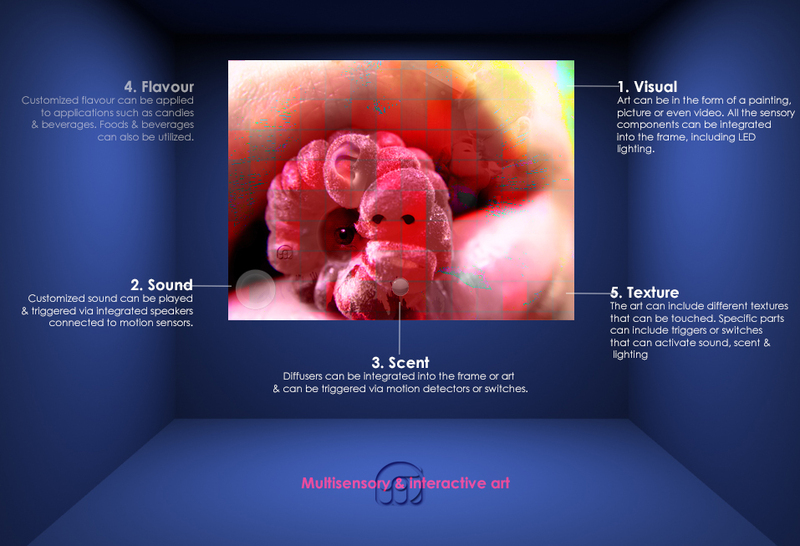 Why not make it interactive & fully multisensorial or even a performance? This can be accomplished with the use of sensors, diffusers, lighting & other technologies. Most art-forms can benefit from multisensory additions, if done properly. The visuals from the art can be enhanced by incorporating LED lighting under the canvas that can be triggered to enhance specific sections. Video elements can also be added. Existing sounds, recordings & songs can played via integrated speakers & recording devices. This can also be triggered via motion detectors &/or switches. Customized scents can be applied to the art & also triggered & diffused in a similar fashion to sound. In past projects, flavours & food ingredients were utilized as the main medium for a variety of canvases. The resulting art had different smells & flavours (if licked). However, incorporating flavour into art is not very practical. Customized flavours be part of the art experience, if food & beverage applications are used. Specific components from a recipe can be added to beverages & confectionery products or customized flavour systems can simply be used. Art, in the form of a graphic or painting, can have textures or have some added. Specific sections can incorporate switches that can serve as triggers for scent diffusion as well as sound. Temperature, air flows & vibrations can also be utilized. Many of the purely artistic projects in my portfolio can be expressed as a performance. One complete example is Valaaminated.